Europe is set to get its own version of the ISA Worlds this summer, with the European Surfing Federation (ESF) getting ready to announce its inaugural European Championships of Stand Up Paddling. The ESF, also known as Eurosurf, is planning the event for June 18th-22nd in Lacanau, France in association with the French Surfing Federation. The format of the Eurosurf Championships (‘The Euros’?) will be identical to the ISA Worlds but without the prone paddlebarding. There will be two men and one woman in each of the three disciplines – short course, long distance and SUP surfing – with a maximum of 16 nations in the entire event. Only European nations can enter. We can expect top world ranked athletes such as Titouan Puyo, Casper Steinfath, Arthur Arutkin, Leonard Nika and Paolo Marconi to be among Europe’s finest on show. Not to be confused with the EuroTour, which unifies 13 straight weeks of standalone races across the continent, the Eurosurf Championships will be a single event held each year, just like the ISA Worlds. The ESF has been talking about this for a couple of years now – they came close to pulling the trigger last summer – but from what I hear it’ll definitely be happening in June, with an official announcement expected later this month. This seems like a great move for Europe, and will surely compliment the EuroTour to bring even more cohesion to the sport on the continent. Indeed, we’re set for a big run of events in the front half of the summer, with the EuroTour’s headline acts leading up to ‘The Euros’ in mid June. As an added bonus, Weeks 5 and 6 of the EuroTour are both in the Basque Country of Spain, which is just a couple of hours south of Lacanau. The only casualty of the Eurosurf Championships will be the Euro Tour’s week 7 race in Croatia, which clashes directly with Lacanau. However that event will still attract some paddlers from outside Europe, as well as the dozens of top European athletes that don’t qualify for the their respective national teams. The European Championships will also fill the void left by the ISA Worlds quite nicely. With the International Surfing Association set to run the Worlds in the second half of the year (most likely Fiji in November — six months later than its usual time slot), the 16 nations competing in The Euros will now have a use for their 2015 team qualifying results. Most countries held their national qualifiers from June-November, which means they probably would have become redundant without this event (most nations will have to run a new round of qualifiers ahead of the 2016 Worlds). So what do we know about Lacanau? For one, it’s got great surf — the annual Lacanau Pro is a WSL qualifying series event, while the town is less than 100km up the coast from the famed sands of Hossegor. Lacanau is also the closest beach to Bordeaux, so if you fancy a tipple of wine you’re in luck. 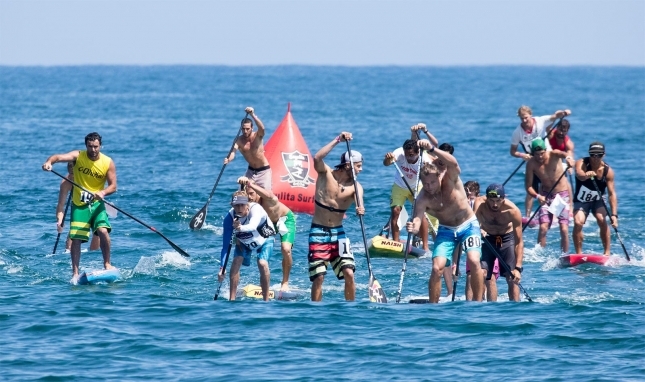 As for the racing side of things: No doubt the short course race will be in the waves (probably on one of the days where it’s too small for the SUP surfing contest; or perhaps organisers will want to create a French version of Salt Creek? ), however the distance race will (hopefully) have a floating format depending on conditions. South West France gets stellar downwind runs, so if organisers are smart they’ll consider that option, while there’s also a “Lake Lacanau” that could be a flat water backup if the surf is too big. It will also be interesting to see how the race format works with relatively few competitors. There will be a maximum of just 32 guys and 16 girls in each race, and considering some countries probably won’t field a full team, that number will surely be even lower. If the ESF follows the ISA’s model of running course race qualifying heats even when numbers don’t warrant it, we could end up with a very small (read: not very exciting) field in the final. Actually I’m not sure why the event is limited to 16 nations at all — I can think of more than 20 European countries that would be ready and willing to send a team. Perhaps it’s to keep the size of the SUP surf contest manageable, but either way I’d like to see the limit lifted so that as many nations as possible can compete in the racing. Apart from that, the only other potential issue with the event is waves: South West France often sees weeks of unsurfably flat conditions in the summer. Given there’s only a five day window for this event, and that three of those days will be required for the surfing, organisers will be praying for a solid June swell.